I love a really good steak. There are so many different variations of meat it gets confusing in the meat aisle. I’m a big rib steak fan but lately I’ve been turned on to other cuts. I learned the hard way that if you want steak you can actually chew it has to be good quality. I rely on American meat for that quality, and usually meat from Alle Processing /Meal Mart never lets me down. A good piece of meat should need nothing but salt and pepper to make it delicious. I want my steak to taste like steak and not the sauce it’s coated in. My favorite piece of meat right now to cook at home is the oyster/mush cut. This is such a tender piece of meat that just melts in your mouth. I use a cast iron skillet to sear it and then finish it in the oven. It’s super simple but oh so good. As I say a lot, food doesn’t need to be complicated to be delicious. Make this for guests and I promise you the rave reviews won’t stop and all it takes is just a few minutes. Take your steak out of the fridge in order for it to come to room temperature about an hour before cooking. Place cast iron skillet on the stove on high heat and add oil to the pan. Liberally sprinkle salt and pepper on both sides of your steaks. Make sure the pan is screaming hot before placing you steaks in the pan. Using tongs lower your meat into the pan so you hear a sizzle. Allow your meat to develop a crust (should take about 1-2 minutes on each side). Flip your steaks to sear the other side making sure you get a nice golden crust. 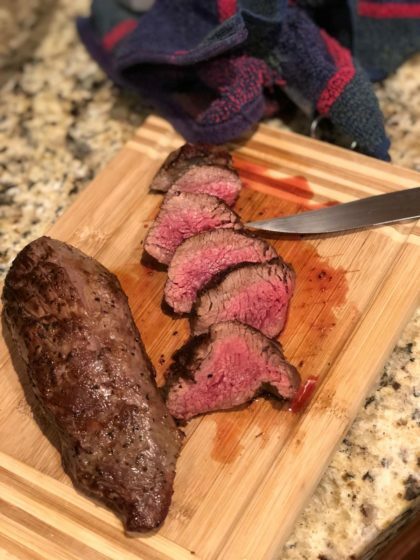 Once your steak has a nice crust finish it in the oven until the meat comes to a temperature of 135 for rare or 140 for medium rare should take 5-10 minutes (you need a meat thermometer or set the oven probe to appropriate temperature). Allow the meat to rest about 10 minutes to redistribute the juices before cutting into.